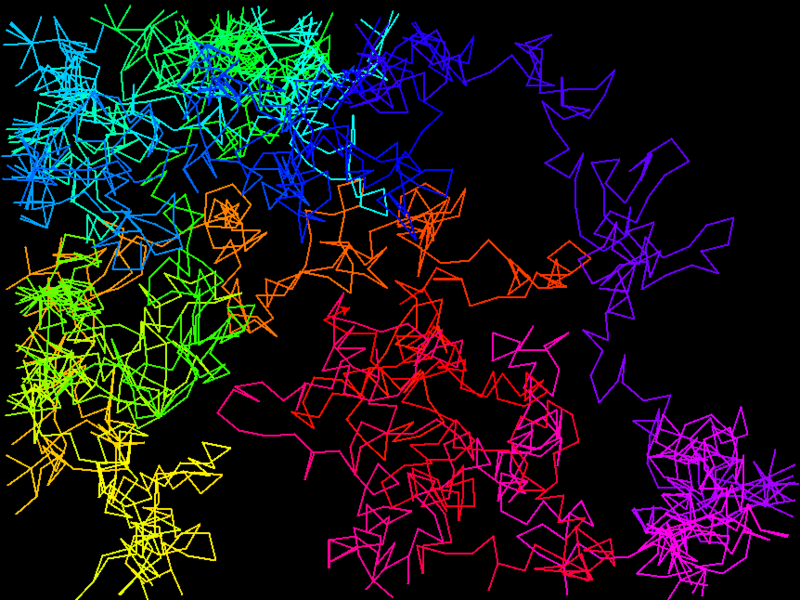 A colourful random walk. The basic idea is very simple: choose a random heading in the range 0:360 degrees. Step in that direction. Choose another random heading & step again. Do this 2,000 times. As a bonus, we go through all the colours of the rainbow (or something similar) from beginning to end. Dealing with colours complicates this program (or any other). The 2 main colour models in computer graphics are RGB and HSV. Turtle and many other graphics libraries accept RGB but not HSV. However, HSV is most convenient for cycling through rainbow colours (I say ‘rainbow’ but there are some hues in HSV that aren’t in real rainbows. Note for example the brownish colour in the picture. Never mind). Just start the hue at 0 and increment it at each step, up to 1 (or 100 in some systems), then convert to RGB using the colorsys library. (x,y)=pos()                         # where are we?